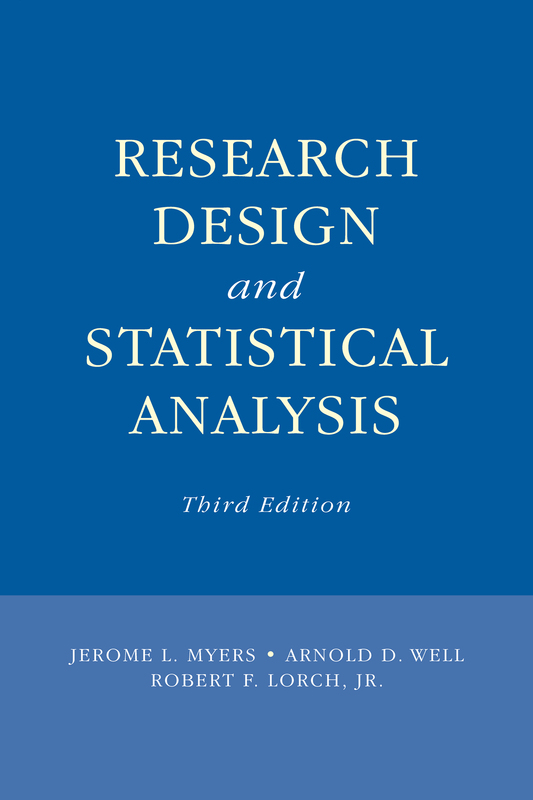 Research Design and Statistical Analysis provides comprehensive coverage of the design principles and statistical concepts necessary to make sense of real data. The book’s goal is to provide a strong conceptual foundation to enable readers to generalize concepts to new research situations. Emphasis is placed on the underlying logic and assumptions of the analysis and what it tells the researcher, the limitations of the analysis, and the consequences of violating assumptions. Sampling, design efficiency, and statistical models are emphasized throughout. As per APA recommendations, emphasis is also placed on data exploration, effect size measures, confidence intervals, and using power analyses to determine sample size. "Real-world" data sets are used to illustrate data exploration, analysis, and interpretation. The book offers a rare blend of the underlying statistical assumptions, the consequences of their violations, and practical advice on dealing with them. Each section of the book concludes with a chapter that provides an integrated example of how to apply the concepts and procedures covered in the chapters of the section. In addition, the advantages and disadvantages of alternative designs are discussed. A new chapter (1) reviews the major steps in planning and executing a study, and the implications of those decisions for subsequent analyses and interpretations. A new chapter (13) compares experimental designs to reinforce the connection between design and analysis and to help readers achieve the most efficient research study. A new chapter (27) on common errors in data analysis and interpretation. Increased emphasis on power analyses to determine sample size using the G*Power 3 program. Many new data sets and problems. More examples of the use of SPSS (PASW) Version 17, although the analyses exemplified are readily carried out by any of the major statistical software packages. A companion website with the data used in the text and the exercises in SPSS and Excel formats; SPSS syntax files for performing analyses; extra material on logistic and multiple regression; technical notes that develop some of the formulas; and a solutions manual and the text figures and tables for instructors only. Part 1 reviews research planning, data exploration, and basic concepts in statistics including sampling, hypothesis testing, measures of effect size, estimators, and confidence intervals. Part 2 presents between-subject designs. The statistical models underlying the analysis of variance for these designs are emphasized, along with the role of expected mean squares in estimating effects of variables, the interpretation of nteractions, and procedures for testing contrasts and controlling error rates. Part 3 focuses on repeated-measures designs and considers the advantages and disadvantages of different mixed designs. Part 4 presents detailed coverage of correlation and bivariate and multiple regression with emphasis on interpretation and common errors, and discusses the usefulness and limitations of these procedures as tools for prediction and for developing theory. This is one of the few books with coverage sufficient for a 2-semester course sequence in experimental design and statistics as taught in psychology, education, and other behavioral, social, and health sciences. Incorporating the analyses of both experimental and observational data provides continuity of concepts and notation. Prerequisites include courses on basic research methods and statistics. The book is also an excellent resource for practicing researchers.